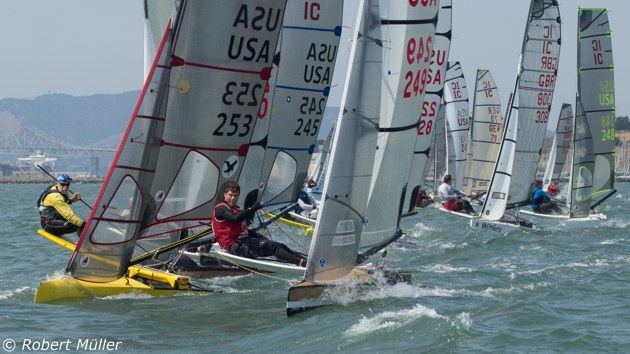 The International Canoe Class raced for the Europa Cup and the British open championship at Hayling Island SC during the week July 27th to August 2nd. Forty competitors from all over Great Britain and from Sweden and Germany enjoyed an excellent weeks sailing and socialising in mainly ideal Conditions. Thirty nine lCs attended. three from Germany, six from Sweden and the rest British. The courses consisted of a first lap of beat, broad reach, beam reach, broad reach and a second lap of a sausage. With each leg set at one mile. they were a good test of boat speed, helmsmanship and stamina. The second race and the second heat was won by Ola Barthelsson with Kalle Strandman second and Niclas Westling third. This race was the windiest of the week with a Force 5-6 keeping the fleet within the harbour. Rob Michael put in a performance worthy of Nigel M in the evenings Go-Karting but could not withstand the attentions of two local drivers brought in to make up the numbers. 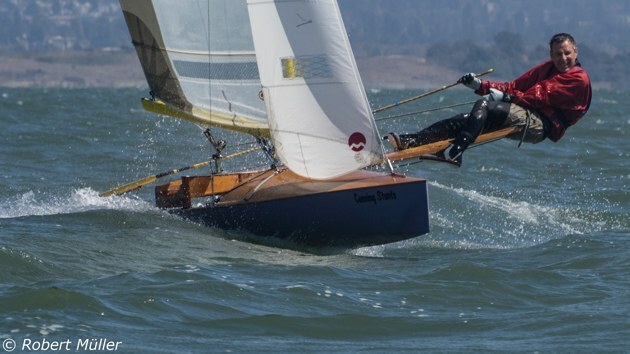 The racing was held out in the bay on the Tuesday. A light and variable breeze was well read by Patrick Marshall to win from Goodchild and Fenwick. The Sailing Challenge Cup and the Novice Cup Races got under way in very light conditions in the harbour at the start of the ebb Tuesday afternoon. Ola and Jens beat slowly up to the windward mark near the clubhouse. and then turned onto the first reach. With almost zero wind they could not make ground over the increasing tidal current. and soon found that the Novice Race contestants who started ten minutes later. were up with them and even in front. Rain was steadily falling by now and without sign of wind. the races were abandoned before all the competitors were sucked out to sea. 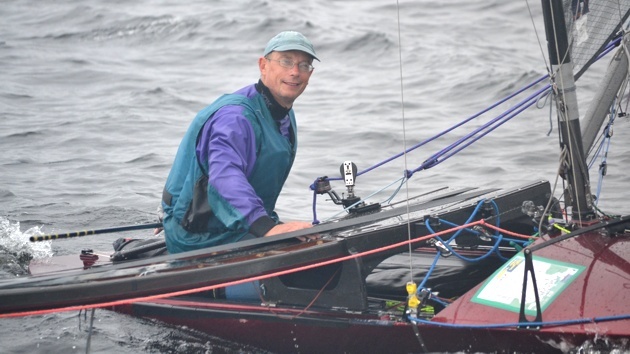 Wednesdays race was dominated by Mark Goodchild who managed to start without weed on his foils for the first time and possibly the only time, and finished 100 metres ahead of Mike Fenwick. 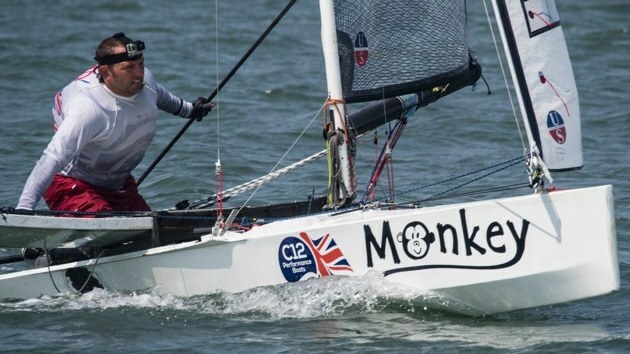 Chris Powles chased them home after a light weather race in which the sea breeze filled in during the last round. 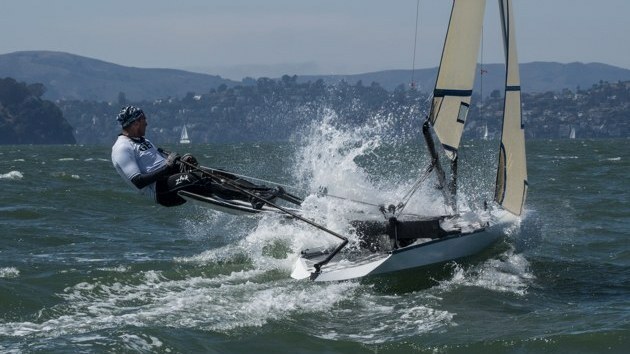 The Sailing Challenge Cup and the Novice Races were rescheduled for Wednesday afternoon and were sailed in a force two south easterly. Jens and Ola competed again for the Sailing Challenge Cup. Ola taking an early lead and didn't let Jens get close enough to make a serious challenge. On Wednesday evening a group sailed over to Bembridge courtesy of Simon Allen and Pat Marshall, where the locals found themselves gently squeezed out of the pub by hungry sailors. Highlights included going ashore via a lifeboat slip and a gentle motor home arriving just after two. Race five on Thursday was delayed by an hour waiting for some wind. It was an important day for Mark Goodchild - with a good result in this one he would have the series sewn up. The race started at midday with a force 3 variable west wind. The early port tack inshore paid best and our ice sailing champion from Sweden, Alexander Sahlin, was looking really fast for a while. However. most of the port tack boats who realised that they were on to a good thing held on for too long and most lost a lot of ground when they had to fetch into the first mark. First around the mark was Kalle and he led the procession for the next four legs. At the start of the third beat there was a wind shift as the sea breeze filled in. 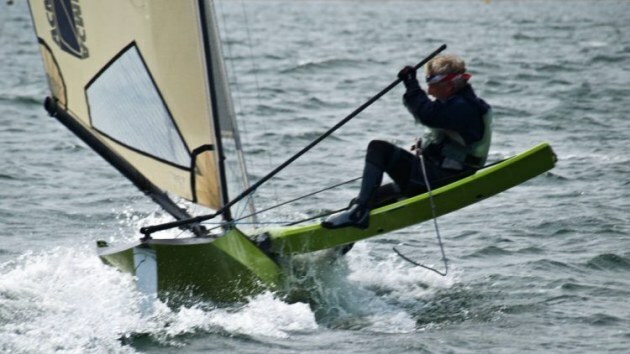 The shift was initially overlooked by Kalle and the other leading boats. The beat turned into a fetch which favoured Mark, who tacked right at the buoy and by the end of the race, four legs later, in a fresh southerly breeze, had gained a 100 metres lead over Kalle. 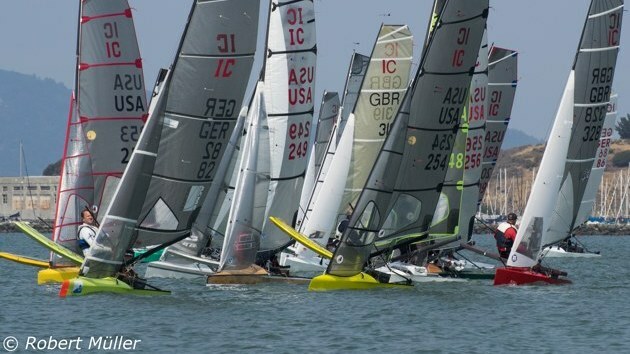 The week was notable for the hospitality shown by the Hayling Island SC and the great spirit and wide variety of boats in which the races were sailed. The canoes ranged from very hi-tech carbon./foam hulls to the all varnished cold-moulded wood classics. 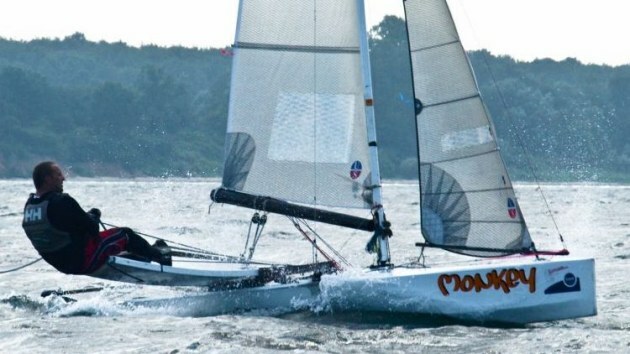 Some of the Swedish competitors sported rigs sat very far aft with sleeved-luff mainsails. These proved to be very fast in the heavier airs, but difficult to tack and slower in the light stuff! Here is a photo gallery of the event from Canoeist Magazine. Its a large (9MB) pdf and may take some time to download.